OGDENSBURG, N.J. (AP) — The New Jersey Democrat hoping to ride a blue wave to victory in a long-held Republican district, and her GOP rival, who has President Donald Trump’s endorsement, traded jabs Tuesday in their first debate, clashing over immigration, Nancy Pelosi and term limits. Democrat Mikie Sherrill, a former federal prosecutor and Navy veteran, and Republican Assemblyman Jay Webber met at a fire hall in Ogdensburg, in rural Sussex County, about 60 miles (97 kilometers) west of New York, along with two other candidates in the open 11th District seat. Twelve-term Republican incumbent Rodney Frelinghuysen is retiring. Webber started on the offensive, praising the economy under Trump and casting Sherill a ticket-mate of fellow Democrats who have called for abolishing the Immigration and Customs Enforcement agency. “I want an immigration system that enforces the law. Mikie runs with people who want to abolish ICE. Mikie runs with people who want open borders,” Webber said. Sherrill responded that she doesn’t want to abolish the agency and said she would not support Democratic House Leader Nancy Pelosi for speaker if Democrats take back the House. She ignored a Webber jab at Democratic Sen. Bob Menendez, whom he called “disgraced” over a federal corruption indictment that later resulted in charges being dropped. Menendez is on the top of the ticket this year. “I’ve always worked with people from very different backgrounds and gotten the mission accomplished and Jay Webber hasn’t,” she said. The race is among the most closely watched this year as Republicans defend their House majority and Democrats hope to flip about two dozen seats to take control. Webber, a six-term incumbent in the Assembly, also said he supported term limits for House members in response to a question from the moderator. Sherrill didn’t answer directly and said Democrats should consider term limits for committee chairmen. Polls have shown the race is close, though Sherrill has had a slight edge in surveys. Webber got a Twitter endorsement last month from Trump, who carried the district by a close margin in 2016. Neither candidate mentioned the polarizing president by name during the debate. 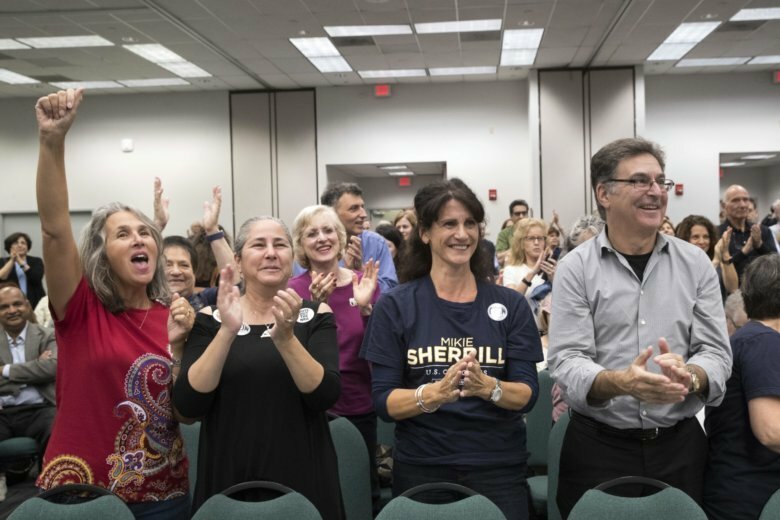 Republicans have more registered voters than Democrats in the district, but Sherrill has raised more cash. Sherrill has about $2.9 million cash on hand as of June 30, according to the Federal Election. Sherrill and Webber will meet again Wednesday in a debate on statewide TV at NJTV. Libertarian Ryan Martinez and no-label candidate Robert Crook are also on the ballot and participated in the debate.